If you are a webpage author or use confidential information on the internet (credit card information, social security number, login credentials for paypal or banking), you might think twice the next time you log into your favorite website. I know I started paying more attention after listening to Steve Gibson's Security Now podcast titled "The Fundamentally Broken Browser Model". That title is a bit confusing, but the underlying issue is very serious. That is why I would like to further explain the issue by providing a simple example, then a real world example using facebook, and then discuss a simple solution. First, what does Mr. Gibson mean by The Fundamentally Broken Browser Model? Well, at this years Black Hat conference, a hacker named Moxie Marlinspike gave a presentation where he talked about how he was able to capture sensitive information at a public WiFi hotspot using open tools he created. Specifically, during a 24-hour period, he intercepted 114 logins to yahoo, 50 logins to gmail, 42 to ticketmaster, 14 to rapidshare, 13 to hotmail, 9 to paypal, 9 to LinkedIn, and 3 to facebook. So how did Moxie do it? He took advantage of a common flaw of most login pages: the login pages themselves are not received by the client over SSL allowing man-in-the middle attacks to change the submit URL. SSL (Secure Socket Layer) has been the common method for securing HTTP, but has been limited to only sensitive areas of a website for performance reasons. Sites have always protected a user's private information (usernames, passwords, credit card numbers, etc) using SSL, but to date no one has thought about actually securing the login page itself and this is a huge problem as most sites don't encrypt their login pages. Not encrypting login forms leaves it open to modification before it returns to the user. This attack has 2 basic steps. First, the malicious user needs to be on the same network (LAN) and utilize ARP (Address Resolution Protocol) spoofing techniques to insert himself in-between connections (this is pretty scary considering how many times I have connected to restaurant, hotel, and airport WiFi hotspots). Second, a LAN user has to visit a login page that was received over a non-SSL connection. To explain the issue better, let me use a simple example (let's leave ARP spoofing out for now). A user visits an e-commerce site http://www.eco.com. Like most sites, eco.com includes a Login link at the top. Clicking on this link takes the user to http://www.eco.com/login, which returns a simple login form in HTML. The user types in their username and password, clicks the Submit button, and their private information is sent encrypted over SSL. It is sent over SSL because the form's action value is set to an SSL URL (https://www.eco.com/login/authenticate). But there is one big problem. The Login link the user click was non-SSL (http://www.eco.com/login), meaning the response back to client was sent over the network as clear-text and could easily be modified by man-in-the middle attacks using ARP spoofing. A malicious user could change the form's submit URL from https://www.eco.com/login/authenticate to http://www.eco.com/login/authenticate and the user would never know it happened. There are few default clues to indicate this is happening. So a malicious user, changes the submit URL to a non-SSL URL, a user clicks Submit, and their credentials are sent as clear-text over the network. Armed with this new information I wondered how some of my favorite sites handle this situation. No matter what I tried, it looked like gmail, ebay, and paypal where safe and used SSL for their login pages. So that gave me some peace of mind. However, facebook provides us with a perfect bad example. If your like me, I type facebook in my browser and use the CRTL+ENT keyboard shortcut to fill in the rest. 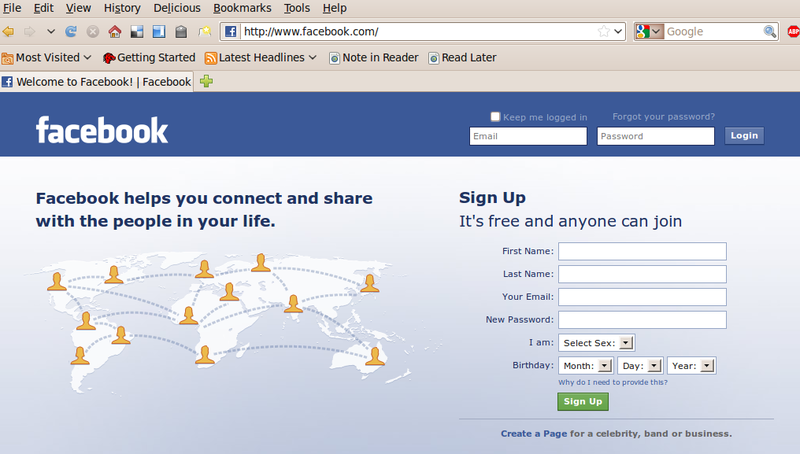 So I end up at http://www.facebook.com. If you are not currently logged into facebook, you are presented with the following home page that includes a form to register or login. Again, this home page includes a login page that was sent over a non-SSL connection. 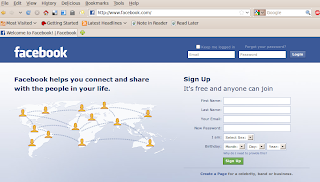 As we expect, if you look at the source, you can see the HTML form does post securely to the URL https://login.facebook.com/login.php?login_attempt=1. So what do you do if you don't want to fill in a form that was received over a non-SSL connection? Fortunately, facebook also supports SSL for its home page (https://www.facebook.com), it just takes a little awareness and an extra step. More sites need to use SSL for their login forms, and not just for when users post their credentials. At a minimum, like facebook, sites should also support SSL and ideally all login forms would automatically be requested over SSL. If you come across a site that initially does not use SSL for the login page, try and use https. If that fails then think about using a VPN solution or even a travellers router. After I recently got a grails app to work with spring-security, REST, and cache I wanted to try my luck and create a Google App Engine application using grails. Unfortunately, I think it's still pretty early as I ran into several issues early on. However, I see enormous potential once these issues get resolved. I am using grails v1.1.1, app-engine plugin v0.8.5, with gorm-jpa v0.5. The first issue I ran into was deploying when using grails app-engine deploy. It failed to work subsequent times after I got the WAR initially deployed using /app-sdk/bin/appcfg.sh. It complained about not supplying an email address. Turns out there is a bug related to ant that should get fixed soon. The work around was simple enough; just hit Enter before typing in your email address. Secondly, I was disappointed to find out that the spring-security (acegi) plugin wasn't compatible in GAE. Based on the compile errors I received locally, it appears spring-security depends on hibernate which is not an option in GAE (you either get JDO or JPA). I chose JPA because according to the documentation, JDO doesn't support any of the GORM dynamic finders methods where as JPA supports most of them. I guess now that I think about it, I'm not suprised acegi didn't work in GAE; just disappointed. I found a minor issue I submitted concerning the default delete action in generated controllers. Seems the gorm-jpa plugin doesn't wrap the delete method around a [Domain].withTransaction closure which apparently is required (see the save action). "The current preview release of the Google AppEngine SDK has a bug that doesn't allow it to run Groovy code when the full permissions restrictions are used. This will be fixed in the next release, but in the meantime the development environment runs without emulating the permissions restrictions of the actual AppEngine environment." Unfortunately, security and performance are often postponed early in the development process and are surpassed for new functionality. Reasonable justification usually includes cost and time. A few of the real issues I think are difficulty and lack of experience. I have to admit I am no security or performance expert, and implementing both early on would be time consuming and difficult. I've always heard security done after the fact is never as good if it's done in the beginning. So I wanted to share my experience using the spring-security (acegi) plugin in grails. Not only did I learn a lot about security, but also how to add support for REST Services and integrate Ajax clients using Extjs, how to enable caching, and inspect the performance of my app using Spring Insight that comes with the Springsource tc server developer edition. Building authentication and authorization into your app in the beginning can be difficult, but with the spring-security plugin and grails it's super easy. There are other security plugins for grails, but I decided on spring-security/acegi since our team has contemplated using it on our project several times and it seems to have a pretty good history. This isn't a how to guide on using the security plugin, the documentation is pretty good. However, I do want to share some unexpected things I ran into and how I arrived at some of my conclusions. In this first test I created an admin role, mapped the admin role to /event/delete, and then added a new user to the admin role. This worked as expected but had a pretty big security hole (see Unexpected observations using spring-security plugin). The issue was unauthorized users were still able to delete events using the edit form. Underneath, grails submits to the index action and the controller handles directing the request to the delete action in the controller bypassing the security created by my Requestmap. I could hide the Delete button on the edit page, but malicous users could still expliot this hole. So instead of using Requestmap, I annotated my controller actions. This method can properly handle the use case above and deny unauthorized access to the delete action. I also learned that users have to be associated with a Role, otherwise they are unable to log in (see post). This seemed rather annoying since I was expecting to use the predefined roles: IS_AUTHENTICATED_FULLY, IS_AUTHENTICATED_REMEMBERED, and IS_AUTHENTICATED_ANONYMOUSLY without having to associate all my users with roles. Two suggestions by Burt where to extend a Base model class that supported a default Role for all Users, or extend the GrailsDaoImpl class to remove the role requirement for users. In summary, it seems best to annotation your controllers instead of using Requestmap and keep in mind that by default all users need to be associated with a role to login into your application. How could I modify my controller to support multiple clients that need HTML, JSON, or XML? To test these questions, I downloaded and installed extjs into my grails app and created a simple grid based on the array-grid example in extjs. As part of this test I wanted to add a Delete button to the bottom toolbar, so that I could later enable o r disable based on the users role. That's pretty much how I disabled certain gui items that are restricted based on role. Again not very pretty, but effective. Now all the client needs to do is request the URI /event/list.json or /event/list.xml. Next, I really wanted to try out the Spring Insight capability that is now included in the Springsource tc server developers edition. This would let you see into how grails and hibernate are operating on your behalf per request. For many web applications, there are typically 2 bottlenecks that degrade performance: 1) number of trips from the client to server 2) number of trips to the database. Using the Spring Insight tool, developers can see what SQL is being executed and how long it took. To get started with Spring Insight I followed their Getting Started Guide. Once I had Insight running (http://localhost:8080/insight), I next ran 'grails war' to create a WAR that I could deploy to tomcat (Note: if you do this multiple times, redeploy, you have to be careful with what you do in your apps Bootstrap class. I was doing a lot of inserts that caused my WAR to fail deployment because by default when running 'grails war', grails defaults to the production environment which uses an update file database. So my Bootstrap was trying to add roles and users that already existed and that caused deployment to fail). The WAR deployed fine and I was up and running watching my apps performance metrics in the Insight dashboard as I moved around in my app. What I noticed first was unexpected multiple JDBC calls when I thought caching was enabled by default in grails. rebuilt and redeployed the war and was able to see fewer JDBC calls proving that my cached domain was working. I then added a new Event, viewed all events, and saw the extra select call since the cache was purged. Pretty impressive! Next I wondered if spring-security was caching all the user and role information by default like it advertised. If not that could be a huge performance issue. Spring Insight was also able to prove that it was caching its results. Overall, I learned a lot about grails, security, REST, extjs, caching, and spring insight and grails was the perfect platform to prototype these concepts in preparation for real production use.